Reading is even more fun when you read with a dog! 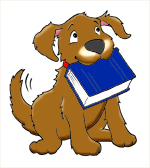 Children may read any book they like to a friendly dog for up to fifteen minutes on a first come, first served basis, but it’s a good idea to phone ahead to the library at 586-771-9020 to make sure one of the dogs will be here. Paws for Reading is a nationally recognized program with the aim of helping reluctant and struggling readers discover the joy of reading with the help of a friendly canine. Read to one of our friendly dogs!